Increasing the compression ratio of luftkopf #1 is long overdue. Aside from being one of the easiest ways of adding horses, the 336 cam wants it badly. 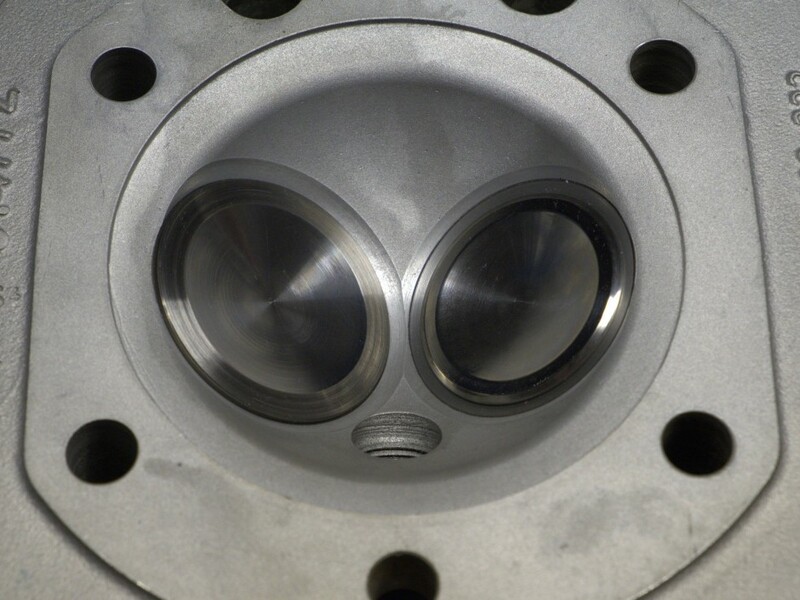 The valve pockets in the piston domes have been deepened to accommodate the higher lift of the cam and I have often wondered what difference this would make to the compression ratio. Not much I suspect but enough to turn my cuiousity into a vaguely unhealthy urge to measure it. Also, having developed a sceptisim of ‘factory specifications’, if I’m to increase CR, I want confirmation of the starting point. The result of the process as set out below was puzzling. I got a compression ratio for the bike of 8.2:1 when the bike is supposed to be 9.5:1 ! This translates to a whole 12cc’s of additional volume in the combustion chamber that shouldn’t be there! Certainly far more than could be explained by deepened piston pockets or valve recession due to a fresh valve and seat grind. 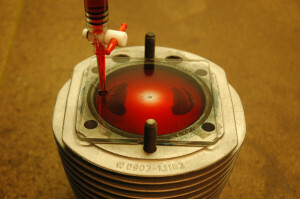 Everything has been checked: Pistons, gaskets, heads measured to check that they are indeed 9.5 items. 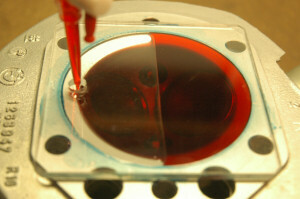 I even went to the extent of using a completely different method of measuring CR in order to verify the first method. This second method showed close agreement with the first and can be found here. So, my sceptisim of factory specifications is even more justified, but could BMW have duped us to such an extent! Please leave a comment you have had similar findings or can shed some light! 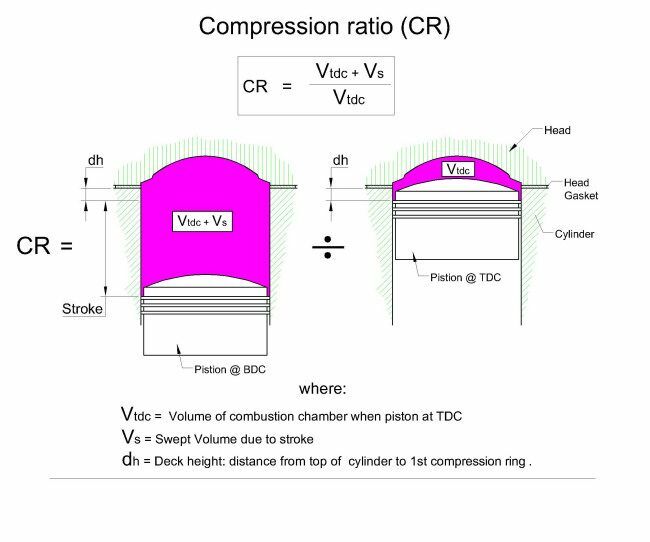 Compression ratio is most easily described as the ratio of the volume above the piston when it is at bottom dead center (BDC) to the volume above the piston at top dead center (TDC). 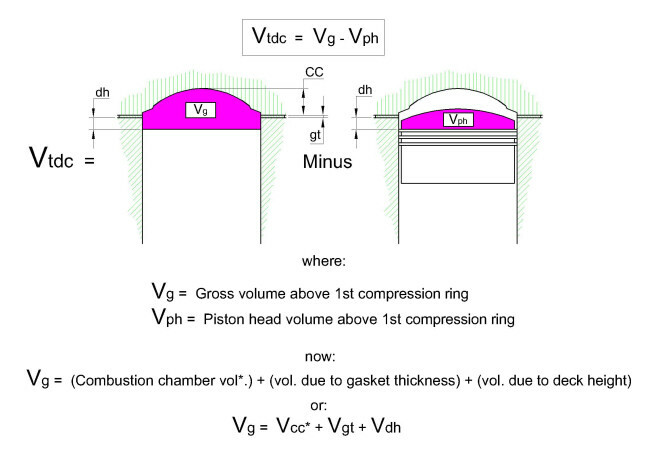 The swept volume, Vs, is easily calculated but not so the complex volume Vtdc. This is worked out with a combination of mathematics and directly measuring a couple volumes with a burette and a suitable fluid. After researching the various ways that people go about this, I came up with a variation which I think better suits the domed head of the airhead piston and is not too hard to carry out. 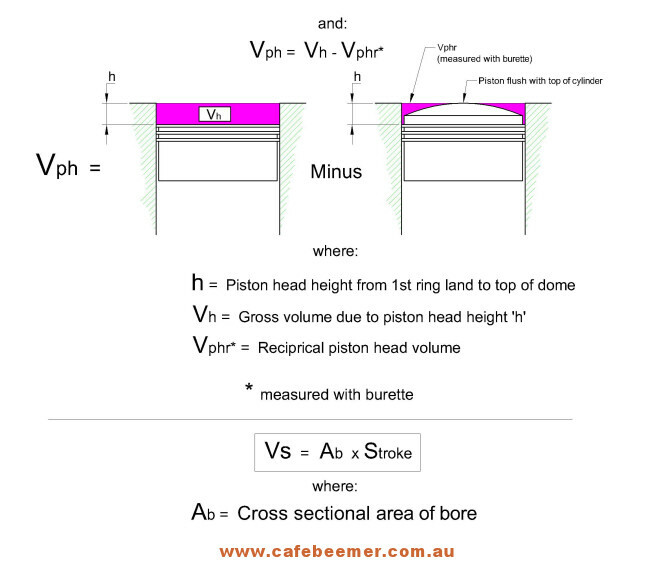 The combustion chamber volume, Vcc is measured directly with a burette. I used a square piece of clear acrylic (plexiglass) about 107mm x 107mm with a 7-8mm hole drilled about 20mm off one side as shown below. 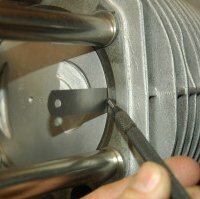 With a light smear of grease around the combustion chamber, the acrylic is pressed down firmly so that the grease is squished very thinly and creates a good seal. The filling side of the head must be tilted up a few mm’s so that the chamber fills towards the hole without trapping any bubbles. The burette is the cheaper acrylic type (100ml) and cost me $27.00. Graduations are 0.2ml. (The glass ones are over $100). I used straight ATF because I had some on the shelf. But found it a little too viscous. It took some time for the film left on the sides of the emptied portion of burette to settle down to the bottom. After an hour, the level rose by 0.4ml… Other people have used spirits coloured with food dye. 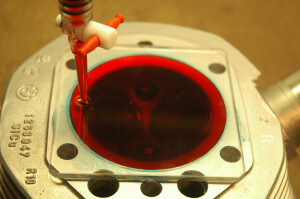 Mind that fluid doesn’t leak past the valves – a light smear of grease around the valve peripheries would help. Vcc was measured at 88.2ml (or cc’s) for both heads. 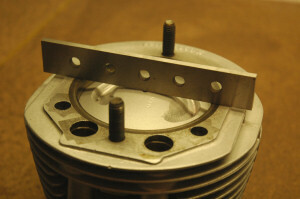 For deck height ‘dh’ I clamped the cylinder to the block using tubes on the studs, moved the piston to TDC and slid a squared off 0.1mm feeler gauge between the cylinder wall and piston so that it rested on the 1st compression ring. A carefully scribed line and vernier did the rest. If you use this method, make sure you slide the gauge in line with the horizontal axis of the gudgeon pin (ie at 3 and 9 o’clock looking directly at the piston) as this is where piston rock is at a minimum. Also, prussian blue would have helped to make out the scribe line! dh was measured as 6.8mm. Measuring Vphr is done directly with the burette. 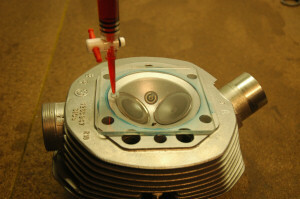 A light smear of grease is put around the top compression ring and the piston driven up the cylinder until the piston top is perfectly flush with the top of the cylinder using an accurate straight edge. 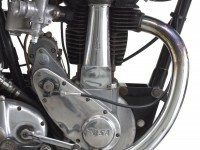 At this point the piston head height ‘h’ (from 1st ring to dome top) can be measured in the same way as ‘dh’ above with a squared feeler gauge and scribed line. Thus h = 16.4mm was obtained. All the raw data for calculations has now been collected. 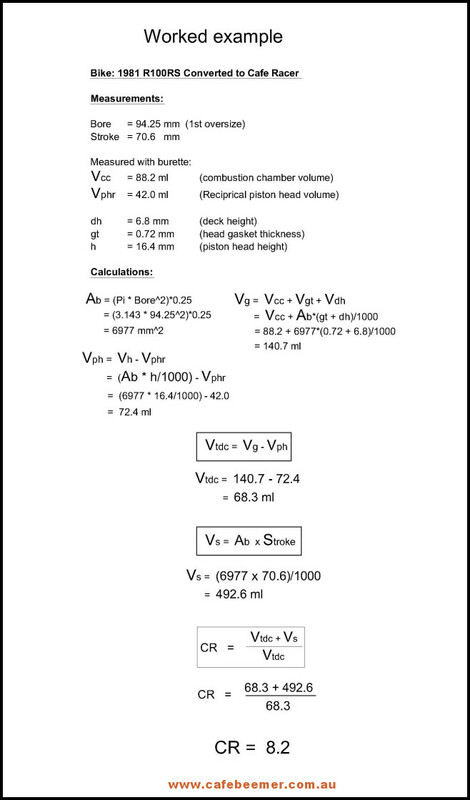 The calculations below reveal a compression ratio of……8.2 : 1 ?! I’ve been following your Salt Racer build and can’t wait to see the finished product, especially the results of the runs. 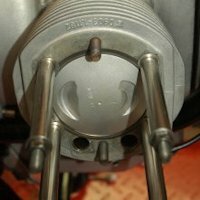 I’m writing because of your findings in regards to the CR you found when measuring your engine. Same thing happened to me on my ’94 R100 GS. It’s been twenty years since I did it and I can’t find my notes, but the measured CR was way below the advertised CR. So you’re right, BMW wasn’t quite as honest, or accurate, as we’d like the Germans to be. FWIW, the engine work I did was larger intake valves, by 2mm, 38 Bings instead of the 32’s, actual compression of 9.5 to 1, 336 cam and a bit of clean up on the ports. Airbox was stock two horn box with equal size horns (bear to dial in the Bings for that). I started with 56 rwhp and ended up with 64 rwhp. Better torque and fuel mileage as well and no more detonation. 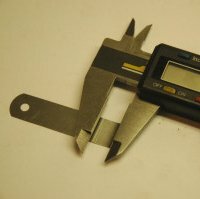 I believe the biggest increase was due to reducing the so called squish band from 3mm to about 1.4mm. Anyway, I’ll be following you guys, good luck. Hi Alex. Sorry, I seemed to have missed your post. The CR exploration was revealing. I’m not quite as diplomatic as you: In a nutshell: any BMW spec sheet for R100’s after 1978 that states a CR of 9.5 is blatant BS!! Those basic mods that you did are the best thing you can do to our humble airheads! Good that you retained the airbox. Yep, reducing squish clearance is critical for performance gain particularly if running a 336 cam with its large overlap. BTW what a nice Salt Racer which I found through a link posted on http://forum.2-ventiler.de/vbboard/forum.php , a German speaking forum dealing solely with BMW’s 2 valve bikes. Thanks for the post Detlef. Yes, it’s amazing what you discover if you independently check ‘factory specs’. I recently joined 2-ventiler. Wonderful forum! Google translating into English but it does a comical job of it..